CANAAN, N.H. - Sept. 7, 2018 - PRLog -- Plasma Technologies replacement (PT A100) includes a CNC & Servo Drive combination housed in a single compact enclosure which is designed to easily replace outdated CNC Drive systems on small/medium sized machines. The Plasma Technologies PT A100 system features a Hypertherm Edge Connect Digital CNC and Yaskawa Sigma 7 Digital AC Servo Drives. The PT A100 comes standard with 200 watt drives, and is designed to update aging Lockformer, Cybermation, MG, C&G, Koike and other small/medium two and three axis cutting machines. Plasma Technologies is also coming out with a similar compact 400 watt system later this year. 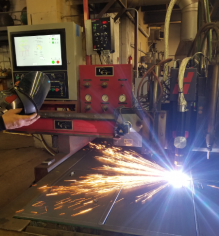 "This new compact package allows us to offer the same product we have for larger machines, with a competitive price," said Alan Bradford, Plasma Technologies President. Plasma Technologies is a New Hampshire based leader in manufacturing cutting machine retrofit systems. For 25 years Plasma Technologies has been providing drive systems and rebuilding machines of all sizes around the world.